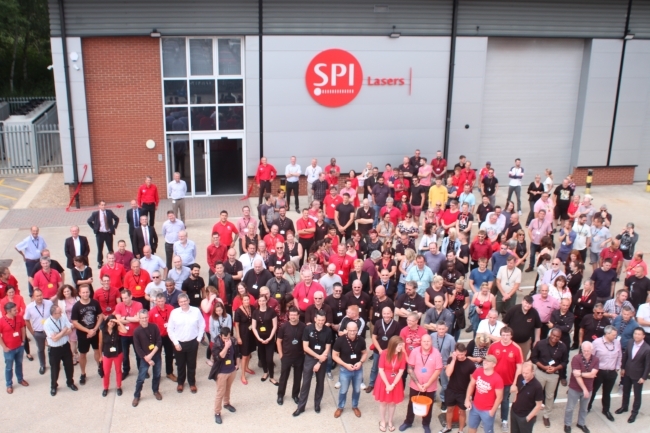 SPI Lasers has celebrated completion of their new UK manufacturing facility with a grand-opening ceremony. Completed in only 6 months, the new building increases manufacturing space by approximately 40,000 sq ft (3,716m2) and its overall site footprint to over 100,000 sq ft (9,290m2). The Opening Ceremony was performed by Dr Christian Schmitz, CEO of Laser Technology for TRUMPF, SPI Lasers’ parent company, and attended by SPI staff from across the UK as well as representatives from TRUMPF, Southampton Universities ORC, and Eastleigh Borough Council. In addition to the expanded production facility the new site will also include a new mezzanine floor to accommodate new offices, product development and training areas, meeting rooms and a staff canteen. The first lasers are expected out of the new facility in August, with productivity continuing to ramp up over the course of the next year. As part of the days’ celebrations attendees were encouraged to wear key colours from the SPI Lasers brand palette (mainly red and black) and make a donation to MIND the Mental Health charity; in total £452 was collected on the day.